I took my time with it, but I finished The Sun Also Rises last night. 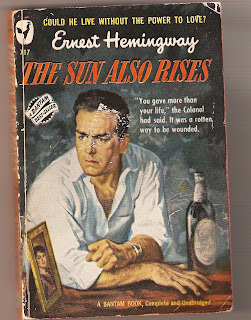 I'm one of those rare young male prose writers who is not absolutely head-over-heels in love with Hemingway, but I do like him a great deal-- particularly his short stories. Several years ago, my friend and mentor Bob Cowser suggested that Hemingway's the kind of writer who writers love and critics loathe. At the time, I tentatively agreed with him, all the while knowing that Hemingway didn't mean nearly as much to me as, say, F. Scott Fitzgerald. Still, I can't escape the fact that Jake Barnes is a great character, and the book he finds himself in is tightly constructed and, in places, elegantly written. A favorite passage encountered last night was "I drank a bottle of wine for company. It was a Chateau Margaux. It was pleasant to be drinking slowly and to be tasting the wine and to be drinking alone. A bottle of wine was good company." Man, I've been there. Plus, check out the cover of the Bantam edition of the book from 1949. I found this in a used bookstore in Marquette, Michigan probably seven or eight years ago, and just loved it. There's Jake, looking all intense and manly, with a bottle of booze and a picture of his beloved Brett beside him. And above the title and the author's name, the burning question that must have enticed all sorts of readers looking for a tawdry, scandalously-tragic read: "Could he live without the power to love?" Indeed.